In my morning trawl through the news websites, I scan the European and British ones with a growing sense of horror. Europe’s crisis of illegal immigration just gets worse. Chilton Williamson, in his recent fine essay Beyond “Immigration” [Chronicles, August 2015] described it as “national and cultural suicide. Such a thing is unknown in the history of the world.” But unfortunately, it’s not quite unknown—something horribly similar happened to the black Xhosa tribe in South Africa in the nineteenth century. But first: Europe. Anyone reading VDARE.com knows about Jean Raspail’s 1973 novel Camp of the Saints, in which a flotilla of boats carrying hundreds of thousands of Third World illegal immigrants beaches on the French Riviera. Paralyzed by white guilt and universalist humanitarianism, the French authorities cave to the invaders. End of France. End of Europe (though Switzerland holds out longer than most). That is pretty much what’s happening. Hundreds of thousands of black Africans and MENA [Middle East and North Africa] Muslims have decamped from their homes and headed for Europe. And the numbers are rising—fast. In the first six months of this year 137,000 boat people crossed the Mediterranean, almost double the number (75,000) in the same period last year. The response of Europe’s elected leaders has been Raspailian: much wringing of hands over those unfortunate enough to drown in the Mediterranean crossing or otherwise perish, much talk about “sharing the burden,” but no forthright action in defense of the homelands. David Cameron, Britain’s current Prime Minister, is typical. He was duly elected; then he was reelected five years later, in May this year. Current immigration numbers are running around 300,000 a year. Cameron’s impotence has encouraged the illegals. In Calais on the French coast they have planted a vast makeshift camp near the entrance to the Channel Tunnel. From there they sally out every day to the lines of trucks waiting to cross over to England. Bedfordshire Police—who cover Toddington Services on the M1, 125 miles from Dover but where migrants are caught daily as they clamber out of the lorries they board in Calais—say they caught an average of 23 suspected illegal immigrants each month and 67 in May. In just two days last week, they found 36 stowaways. The spinelessness of the British also encourages the French authorities, who are happy to see the illegals smuggling themselves out of France. The French provide essentially no law enforcement on these French highways. David Cameron’s marriage appears to be a genuine love match, but in regard to Calais, he may in later life come to nurse some sentiment similar to Mary’s. Elsewhere in Europe things are even more dire. 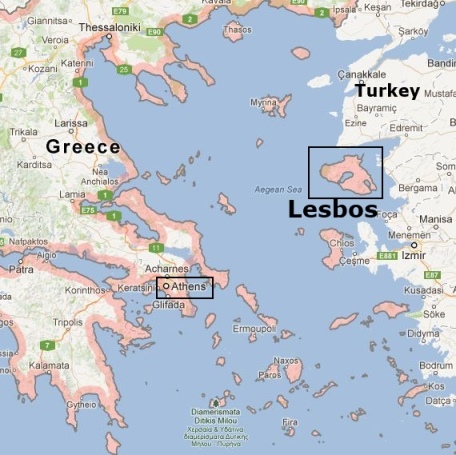 The little Greek island of Lesbos, native population 86,000, received 15,000 illegals just in the month of June. There is no prospect of any end to this problem. There is, to the contrary, every prospect that it will get far worse. It is conceivable—just barely—that the Muslim nations might attain some kind of stability, or at least that those currently stable might do more to rescue their co-religionists, who make up the genuinely refugee portion of the boat people. The African component, however, is driven by brute demography; and the reservoir supplying it is essentially bottomless. Afrikaner nationalist Dan Roodt is making a blunt assessment of the possible futures. The sad truth is that Africa’s “economic miracle” will never happen. As the population grows, survival will mean only one thing: emigration. The bright lights of Europe and North America–and of South Africa for those who cannot manage to leave the continent–will exert a hypnotic attraction. Many Africans will buy plane tickets financed by their relatives already overseas, or by Western aid money, and those who cannot afford to fly will pile into rickety ships to cross the Mediterranean. The African avalanche is inevitable. It makes the U.S.A.’s immigration problems with Mexico look quite picayune by comparison. Back to the Xhosa. Is it true, as Chronicles’ Williamson suggest, that “national and cultural suicide … is unknown in the history of the world”? In the most literal sense of total annihilation, perhaps; but the Xhosa made a determined national suicide attempt, in 1856-57. The Xhosa—the pronunciation is something like “Kaw-suh”—were at that time a pastoralist people living in southeastern South Africa. As Britain’s Cape Colony expanded through the early 19th century, the Xhosa resisted, and there was a series of frontier wars. The most decisive of these frontier wars was fought from 1850 to 1853. It ended with defeat for the Xhosa, who lost much of their land. To compound their misery, from 1854 their cattle were afflicted with bovine pneumonia, brought in by European settlers. Mhlakaza had a niece, fifteen or sixteen years old. One morning in early 1856 this girl and a companion, out in the countryside beyond their kraal, saw a vision of two long-dead tribesmen. The apparitions declared themselves heralds of a “new people.” A great resurrection was coming, they said, a remaking of the world. New cattle would appear, and plentiful new corn. The tribe’s dead ancestors would rise in multitudes and sweep the white men into the sea. However, a necessary precondition for this rebirth was that the Xhosa must kill all their cattle and scatter all their corn. The girls went back to the kraal and told the tale. Uncle Mhlakaza picked it up and ran with it, becoming the prophet of this cattle-killing cult. A ghastly tragedy followed. The call by the “new people” to destroy their herds in their entirety, regardless of whether they were infected [i.e. with pneumonia], meant for the Xhosa the literal sacrifice of themselves, an act of faith in the belief that only thus would they save themselves from the crisis of survival that had beset them in its variety of manifestations. That is what they proceeded to do. Mhlakaza set a date for the eschaton: the coming full moon in mid-July of 1856. The date came and went with no resurrection. The prophet recalculated: August! This cycle went on for months, until February 17th, 1857. Mhlakaza swore that day would definitely, absolutely bring in the new world, and that the sun would set immediately after rising that morning. By that point the cattle had been killed and the corn destroyed. In the British-controlled territories, the authorities had laid in food stocks and missionaries provided relief, saving many lives. But at least 15,000 Xhosa died in those territories out of an original population of 105,000. In Xhosa lands beyond the river Kei, where there was no such provision, mortality rates were far higher. Estimates of the total who starved to death begin around 60,000, but nobody really knows. There is some consolation in learning that whatever the number, Mhlakaza was among them. The Xhosa people survived—Nelson Mandela was a Xhosa, born in the village of Mvezo in Umtata, eighty miles from where Mhlakaza’s niece had her revelation—so this was not strictly speaking a case of national suicide. The cattle-killing can, though, I think, be counted as a pretty determined national suicide attempt. A significant point: You might think, for example, that those monthly disappointments from July to February would have caused much falling-away among believers and rising anger against the prophet. It may be that the universalist ideology now has as firm a grip on Western minds as Mhlakaza’s promises had on those of the Xhosa. As that people’s tragedy shows, millenarian cults, once set in motion, will keep going right over the cliff edge, using the last of their breath to curse the dissident minority whose treasonous doubt caused the gods to withhold their bounty.